THE ARMY TRAVELS ON ITS STOMACHNapoleon was right. Hungry soldiers in the line can stand the grind much better if they know that there will be food on hand when they are relieved. 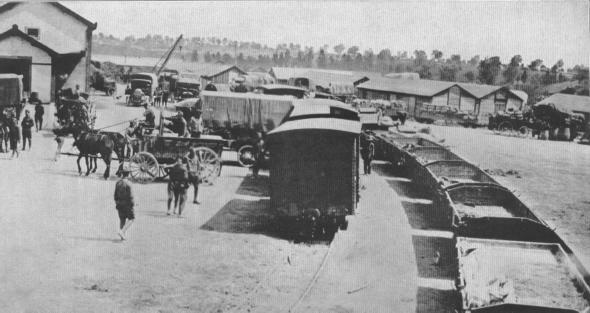 Supply Depot, 26th Division, Menil-la-Tour, France, May 25, 1918. AWAITING THE SOLDIERS' RETURNThis spot was what the soldiers knew as a "ration dump." 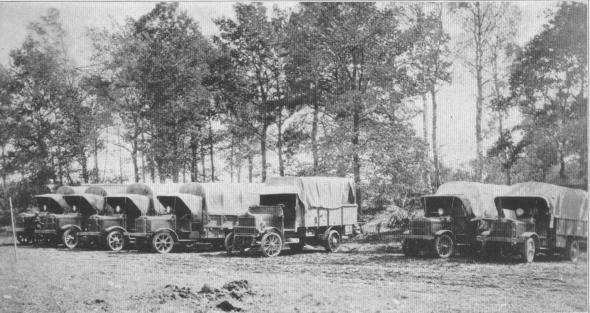 The seven immense army motor trucks are lined up to unload rations for the men on their return from the front lines where they have been fighting for several days.